The discovery of a thermophile in Yellowstone National Park (YNP) in 1960s is the reason modern science has been able to sequence the DNA genome of any organism, including the complete human genome; better understand and treat genetic diseases and aid law enforcement in identifying criminals? In 1967, microbiologist Dr. Thomas Brock and undergraduate student Hudson Freeze (Indiana University) were able to isolate a novel bacteria, later named Thermus aquaticus, in the Lower Geyser Basin of YNP. They discovered Thermus aquaticus was living in temperatures around 70 C (158 F), a higher temperature than any other known organism at the time. In order to survive at this temperature, Thermus aquaticus must copy its own genetic information with a thermostable enzyme, DNA polymerase, in order to survive and replicate. The discovery of this DNA polymerase enzyme and its application in a process called Polymerase Chain Reaction (PCR) resulted in a Noble Prize for biochemist Kary Mullis in 1993 and has lead to the biotechnology revolution. PCR acts as a sort of molecular copy machine, allowing for the duplication and amplification of DNA from a very small sample. PCR testing is now common in labs across the world. The Greater Yellowstone ecosystem boasts a vast scale and diversity of life. Yellowstone’s most striking attributes, its geothermal features, are a source of scientific advancement through discoveries about life in these extreme environments. 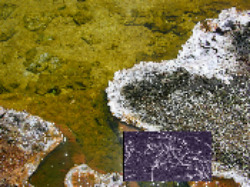 Many of the beautiful and vivid colors seen in thermal features are the result of unique microorganisms present in the springs. Despite the harsh and varying conditions of Yellowstone’s thermal features: highly acidic or alkaline, super heated or filled with toxic metals, each thermal environment is thriving with its own unique brand of microbial life. The revelation about the extremes in which organisms can survive, and thrive, opened a portal of scientific discovery that has directly lead to significant advances that affect our daily lives in the areas of genetics, medicine, environmental sciences, and alternative energy. TBI researchers continue to work on discovery and novel applications for these extreme microbes. In recent years, TBI researchers have discovered a fungus on plants living around the rims of YNP thermal features, which enables plants to be more heat tolerant, thus having applications in agriculture for drought stricken crops. TBI researchers have isolated organisms that help convert wood chips into renewable energy and organisms that produce oil for renewable biodiesel. Current biotechnology is based on the very few microorganisms that have been grown in a lab. Estimates of microbial diversity indicate that less than 1% of microbial species known to exist have ever been grown in a laboratory. Even with the current explosion of biotechnology, 99% of microbial biodiversity is still waiting to be discovered. Half of the DNA sequences discovered in YNP thermal features are so unique, they cannot even be named; imagine what is waiting to be discovered!